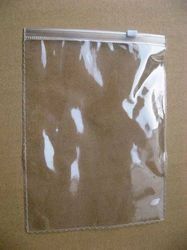 Our product range includes a wide range of pvc zipper pouches. By maintaining our sync with the latest market trends and developments, we are bringing forth an exemplary collection of PVC Zipper Pouches to our customers. Manufactured using the premium quality material, these are installed with small zips to make them sir tight. Used in homes and other food joints to pack food, these are highly demanded.